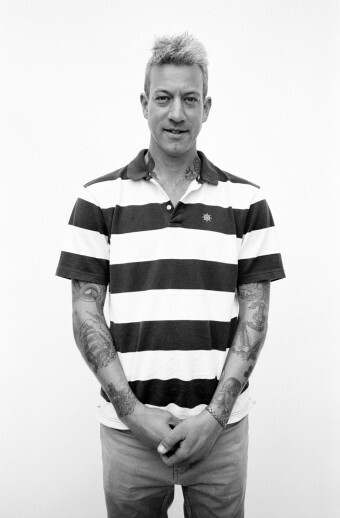 Brian Anderson Interview | F.G. Standing over six feet tall and covered in tattoos, Brian Anderson is an example of how skateboarders can be so easily misunderstood – as he is one of the nicest dudes to ever step on a board. He is also one of the most recogniseable names within skateboard culture. He’s ridden with Ed Templeton and Jamie Thomas on Toy Machine, Koston and Carrol on Girl and has amazing parts in ‘Welcome to Hell’, ‘Jump Off A Building’ and ‘Yeah Right’. Recently, Brian started up his own company and is one of the few skateboarders to have a shoe with Nike SB. With such and esteemed career behind him and his future endeavours looking promising, Brian is an inspiration for generations of skateboarders both past and present. How long have you been skateboarding for and how did you start? I’ve been skateboarding for 27 years, I started when I was 10. My neighbour had a Banana Board and she’d let me borrow it, all I had was roller-skates. When we would go sledding in winter I would always stand up instead of sitting down and sliding, it was before snowboards existed. I also used to play football; I liked doing things with my feet. The sensation of cruising down a hill on a skateboard, instantly I liked it so I just kept going. Aside from skateboarding, you’re also well known for your artwork. Where did your interest in art come from? I guess part of it probably started because I come from a big family. We weren’t poor but we had to share so we had a lot of paper, pencils and crayons. We did a lot of things that didn’t cost a lot. We didn’t go to Disneyworld or anything like that. We just stayed around my neighbourhood and played outside. So in the winter I think I was just always drawing. Then in high school I had a couple of cool art teachers so they kept me interested. I worked with bits of clay and stuff, I just naturally liked it. Also I always tell everybody that my dad was really good. I can sketch around but my dad was really good at watercolour and could do figure drawings. So at a young age I saw him drawing and I was very attracted to that. Do you feel skateboarding could be considered an art form? Yeah, I guess if you call certain things the ‘arts’ like theatre or dancing. There’s definitely a movement to it that can be considered an art form. Skaters like to cut our shoes up and customize our jeans and all that (laughs). It’s pretty artsy overall. Some skaters just grow up nowadays in a skatepark but I live in New York so I see a lot of kids that definitely have unique styles here. So do you feel there’s a cultural divide in skateboarding because of some kids just sticking to parks and not embracing other aspects? I think it’s always gonna be like that in everything. They’re maybe more simple and not as interested in the artistic side of things and that’s fine, it takes all sorts to make up the world. There’s gonna be some major football player that’s into playing guitar or things besides football and there’s always gonna be that team-mate that only wants to play football. But definitely because there’s so many skateparks, there are more kids growing up that only know that world. Also, because of the internet as they grow they learn more about variety of music and stuff. We would probably learn it on the street or at high school before. Kids are definitely exposed to more these days so I think it’s alright. They’re all learning a lot in skateparks still, if they find it uninteresting they’ll take it to the streets and get a little more creative. What are your biggest influences inside and outside of skateboarding? Inside skateboarding my influences were always Mark Gonzales and Jason Jessee. Off the top of my head; Ed Templeton, I was really into his style and crazy weird graphics he drew, I liked Chris Miller, Neil Blender, LanceMountain…. I’m probably not thinking of so many people…Jason Lee, Guy Mariano, the whole Blind video (Video Days). Once we all got VCRs and video tapes the other thing that really influenced me was the Planet Earth video; Juvante Turner, Brian Lottie, all kinds of people. Outside of skateboarding I would say I was probably influenced by people like David Bowie and Keith Haring. When I was a kid I was really into Motley Cru, I liked people with wild clothes and weird hair. Definitely the period I grew up in was glam rock (laughs) so I was a little kid listening to Madonna and heavy metal. I have eleven sisters and two brothers. My sisters always had incredible records around the house; my dad listened to Jazz, so I grew up with a huge variety of genres of music too besides just skateboarding. I feel really lucky I had all these sisters to give me R.E.M. records before you had the internet y’know? You said Lance Mountain was an influence, how does it feel now you both ride for Nike SB? It’s great. I slowly got into being a pro skater from Donnie Barley, he introduced me to Templeton, so I was around more and more contests. At the beginning I would see someone like Lance and he’s standing 10 feet away and it was crazy. I would sit on my floor and watch this guy and now I’m at the same contests with him, wearing the same badge around my neck. Over the years you get used to those things and that comes with any industry. I love it because Lance and I get along really good; it’s always a pleasure to see him. When we go on tour he’ll tell so many cool inside stories about videos we’ve seen and grew up on. It’s a real treat. He’s a really nice guy, just a skateboarder at heart too, super fun to be around and I just feel lucky to be involved. Does drawing help you unwind from skateboarding? Definitely, I’ve almost always carried a sketchbook or camera. You can only drink so much beer in the van and all that. It’s nice to have my sketchbook and it does get me out of it. Also I save a lot of things so the next year when I open it back up I have all these memories from all trips around the world. It helps me escape and relax and also it provides a good memory for the rest of my life. It’s nice. 3D Skateboards – what’s it like being in charge of a company instead of just riding for one? I love it, it’s challenging. I’m on the phone constantly with Brad Staba. It’s been alright in regards to the team so far because it’s just me and Austyn. In the beginning with Alex (Olson) wanting to do something different, that was stressful and hard but I expected that. Alex is very particular. But it’s been great, it’s really rewarding to have all these ideas and then see them finally come out after doing all the hard work that it takes to get things approved and getting everything paid for. It’s a lot, but that’s what I wanted, I wanted to challenge myself so I’m happy, I’m working really hard. Did you do all the artwork for 3D’s first run of decks? I will do more hand drawn graphics in the future. I had a bunch of ideas I wanted to see on the wall right away like that colourful plain board with the banana. Brad and I had an artist friend that lives close by, so I would find the perfect colour, email it to him and would sketch out how I want the banana laid out. Then take a photo of it and send it to the artist, Brad’s really good at piecing things together. I would have all my ideas ready and sketch them out, Brad would help me and we would sit down and look at them. Then call the artist and say “hey change this shadow…move this colour…this yellow needs to be darker” and so on. We had to make boards super fast. That whole catalogue began distributing in two months so it’s pretty gnarly if you realize what it takes. I’m really proud of how fast Brad and I got everything ready for that Agenda Tradeshow, it was rewarding. Did you have a favourite out of the first run of boards? Yeah it’s got to be the Bear. We all know that was Rocco’s influence and where that came from. I never had that board growing up and always wanted it. Even before the trend of wood grain recently came back, I was always a huge fan of the colourful simple graphic in the middle and wood grain left alone. I like the plain one with the crowd and I like Austyn’s tickets. I mean, I like them all. I had all these other ideas but narrowed it down to that group. But the Bear’s probably my favourite, I’m gonna be riding that one a lot (laughs). To what degree will being a pro skateboarder for so many years help you better understand your riders’ needs? It helps immensely because I’ve been on so many tours that have been too long. I’m trying to make 3D really small. I wanna go on smaller trips; I mean I had tons of fun on all the big Girl trips. I don’t think it’s because I’m getting older or whatever but after a while people start to get on each others nerves and things like that. I just want Austyn to be happy, we’ll just do some small trips at first or maybe we’ll go on a couple with Shane O’Neill and Dan Plunkett. I think it really helps to have all that experience because I know the importance of waking those guys up on time. I know how to team manage too from all the years. Make sure we got plenty of skate tools or wax in whatever van we’re gonna go on tour with and be prepared basically. I like taking care of people so that’s gonna be a fun part of running it. Individuality could be considered paramount to skateboard culture, both you and team-mate Austyn Gillette have very distinct styles. Are you hoping to take on more skateboarders with a different and unique approach to skateboarding? Yeah I would hope so, people that are like he and I, that have other interests. Like any team you wanna find people you are comfortable with on tour. Of course, I would love to find somebody with a unique style that has variety. Somebody who’ll wanna be at a ditch, at a skatepark or be at a ledge. If not, if they’re a cool person and just some kid who’ll want to jump down stairs and handrails all day that’s fine too. We want people to come to us, I’m not trying to steal anybody. We’ll figure it out, I’m gonna see Austyn in September and we’ll start talking about the next step. I just wanted to make sure that we got the tradeshow done. Also I had to release that Nike shoe, so it’s been a pretty crazy three or four months for me. Any plans for a 3D video or promo? Yeah, I think that’s what we’re gonna start working on. I’m also working on the Nike video for the third Chronicles. Again, Austyn and I are gonna hang out in September, he just did the whole Euro Tour for Huf so I think he’s home, playing his guitar just relaxing (laughs). In September he’s probably gonna come up to the Bay area and hang out at the warehouse. We’ll take it from there. I wanna make something cool, different and small like a promo for sure. We’re gonna start working on that and figuring out a date for our first little trip soon, we haven’t even gone on a trip yet so I’m pretty excited about that. What was the design process like for the ‘Project B.A.’? Well I like to sketch, so I had a lot of little silhouette sketches of what I thought I wanted the shoe to look like. It was really great because I worked with Fabrizio at Nike SB, he’s a skateboarder who went to school for footwear design. He’s really aware of the variety of materials and stuff. I drew the silhouette, he turned it into a crazy tech drawing and then we started looking at materials together. It was very hands on, I had everything to do with the design and we did 14 hour at Nike, we went in at 8 and left at 10pm. It was crazy, just drawing and drawing all day, going down and looking at samples. It was a really fun process. So you had full creative control over the design of the shoe? Yeah 100%, absolutely 100%. I’m so happy with it, it’s awesome. What was it about the running shoe silhouette that appealed to you? We started working on it two and a half years ago and at the time, you’d walk around a skate shop and everything is like a Stefan or a Vans. I just felt if Nike was gonna let me create a new shoe, I wanted to make it really different, I thought there was gonna be a time in our culture when something different on the wall would look cool after everybody was rocking vulc shoes. Don’t get me wrong I love vulc shoes, I love Stefan’s shoe, but I’m glad because it seems like people are really digging it. I know your gonna ask about the influence and a long time ago when I was on Axion, Guy Mariano had one shoe with the upturned running shoe toe. I loved that, I said “lets do something like that, let’s put some Lunar in it.” They instantly loved the idea and we started running with it, sorry pardon the pun (laughs). We took off on the design side, had a few meetings, Nike were really happy with our direction. You’ve designed boards for Girl Skateboards and a clothing range for Fourstar. How was designing a shoe compared to past projects? I really enjoyed it because I’m comfortable in that environment. I’m not trying to toot my own horn or whatever but, because I have so many interests outside of skateboarding I can be at Nike all day and do creative stuff that I think not a lot of other skaters aren’t interested in. That’s probably another reason why Nike let me be so involved. They knew I was really passionate about the design. It was incredible, I didn’t go to college for this and here I am sitting in these meeting at Nike with important, high up, people doing presentations and talking about my life. I was thrilled to be able to do that, it made me think that I want to keep trying to do more in the future. I love working for Nike, it’s awesome. Out of all of Nike SB’s collaborations with artists which have been your favourites? I’ll go ahead and give my buddy Brad Staba props; he did a shoe that looked like a rollerblade, (laughs) that was pretty funny. But, man I got to tell you, I’m not much of a sneaker nerd or whatever people call it. Let me think…Brad’s the first one that comes to mind, the rollerblade was pretty good (laughs). One last question, how important do you feel it is for skateboarders to have other creative outlets? I think it’s pretty important unless your just interested in what people call ‘training’ everyday. That’s fine but that could make you end up and hating the industry. So, I think it’s important to have other interests. Just get out, leave your board at home one day, or just go for a bike ride. As I’m getting older I’m getting into stretching and doing things to take care of myself, I’m always walking my dog. Drawing is really helpful; I wouldn’t recommend graffiti because you can go to jail. But stuff like that is always cool. Then when you go back to your skateboard your feeling refreshed. Yeah it’s very important I think. It’s just how my brain works, I need to do other things, I need to have other outlets…otherwise I would explode (laughs). Tags: 3D, Austyn Gillette, Brian Anderson, Nike SB, Sidewalk Magazine, skateboarding. Bookmark the permalink.